Carton live storage provides a fast and efficient picking system for handpicked goods being stored with adjustable pallet racking or longspan shelving systems. Working on First–in, first–out (FIFO) principles, boxed goods or SKU’s are placed onto specially designed roller tracks angled at a slight gradient, enabling goods to be loaded in one side then retrieved the opposite end. Carton Live Storage makes efficient use of space, reduces order picking times, minimises picking errors, increases throughput and is ideal for stock control of date sensitive items. 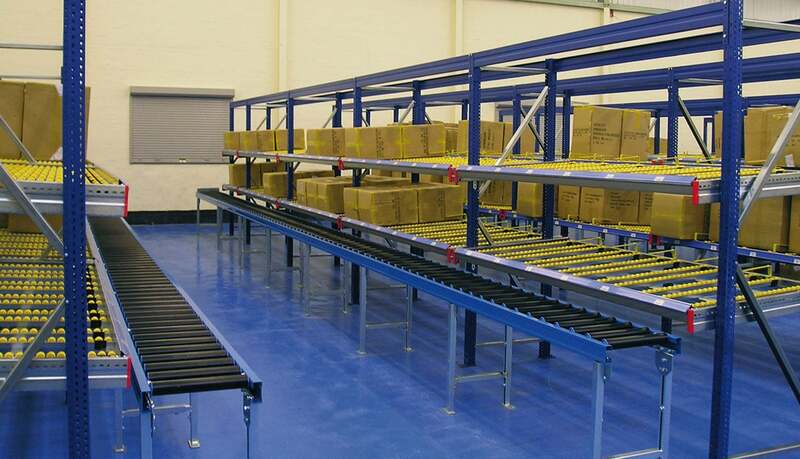 Carton live storage systems can be fitted with optional lane guides to provide separation of products, and drop down angle tilt shelf to enable picked goods to be retrieved easily. Want to find out more about Carton Live Industrial Shelving? Call Us Today! !